I replaced my rear license plate bulb with LED bulb due to the fact that with the on off road and jumping on and off the sidewalk and the BBK kit the OEM bulb filament will vibrate enough to cause it to break and when I replaced this OEM bulb with a aftermarket LED bulb I notice the current or the voltage on the bulb circuit too much it causes the solder joint or circuit trace to melt on the LED connection causing the rear light to fail. I soldered a heavier gauge wire as the replacement trace and it melted that off and caused rear tail light failure. I assume adding a resistor of some value will reduce the voltage/current load on the after market LED. Cheap Bulb or you have a wiring issue. Also never heard of a stock bulb having those issues with a bbk on off road etc..
remember I do a lot DIY with both of my 2014 groms from BBK kits and such and with both groms combined mileage over 20,000+ miles I put those groms thru the paces, riding all over Northern Calif Bay area from San Jose to San Francisco, Hollister, Santa Cruz, Half Moon Bay, etc takes a lot of beating when I ride it like a stole it. 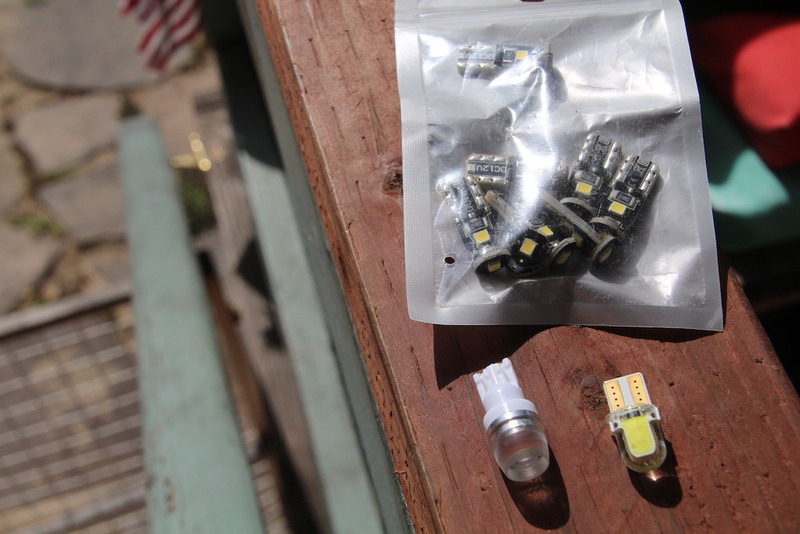 The bulbs I used are Honda OEM grom license plate bulb and the LED bulb are the ones off ebay chinese made. I have ebay LED bulbs on my front head light, my blinkers, my rear tail/break light and the only one giving me problem is the rear license plate bulb light. I guess since no one knows the answer I will put some load resistor inline with the rear license plate bulb + wire. Last edited by CiscoSanJose; Yesterday at 09:21 AM. If its melting you have a wiring issue or cheap bulbs. Buy a known brand? lol Dont know what DIY stuff have anything to do with that though lol doesnt everyone ride there grom like they stole it? I know my 170 is abused daily. Agreed, you either have an electrical issue or a bad bulb. The off road DIY BBK 20K miles should have nothing to do with it if done right. Stock wire harness since 2014 so it is not the wire since if I use OEM honda bulbs the filament will just vibrate and snap, the stock 2014 stator and rectifier has been upgraded to 2017 stator and rectifier. This info is for people who are going to do the complete LED bulb change on your older grom. Last edited by CiscoSanJose; Yesterday at 10:20 AM. you don't need a load resistor for a static led bulb. you need a decent bulb. so what is the part number of your LED license plate bulb, seems there is so many nan's but no proof of a P/N to solve the problem I'm having so load resistor goes in. i dont run one, use my tail light, but 20 seconds found one on the web. 194s are super common. I used that bulb, see those two tin wire that connects to the wire connector does vibrate loose, I tried three of those bulbs so I went to three other LED bulbs and the ones in the package worked for 1/2 day than burn out the wire trace. I even tried these and the one in the package lasted the longest 1/2 till the solder melted the end LED unit off, the other two melted the connecting wire on the bulbs so I think it's current/voltage drain that needs to be addressed that is why the load resistor might work. Last edited by CiscoSanJose; Yesterday at 11:21 AM.